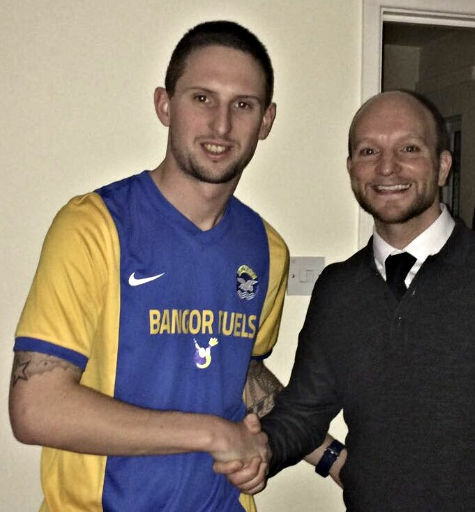 Bangor have this evening completed the transfer of Ryan Arthur from Knockbreda. The 22 year-old 'no nonsense' defender has previously had spells with Larne, Ards and Carrick Rangers. Welcome to the Seasiders Ryan! Departing the Seasiders in the last few days is midfielder Mark Magennis. Mark is taking up a new role as Assistant Manager to former Bangor player Billy Youle at Shorts. We wish Mark all the very best in his new role. 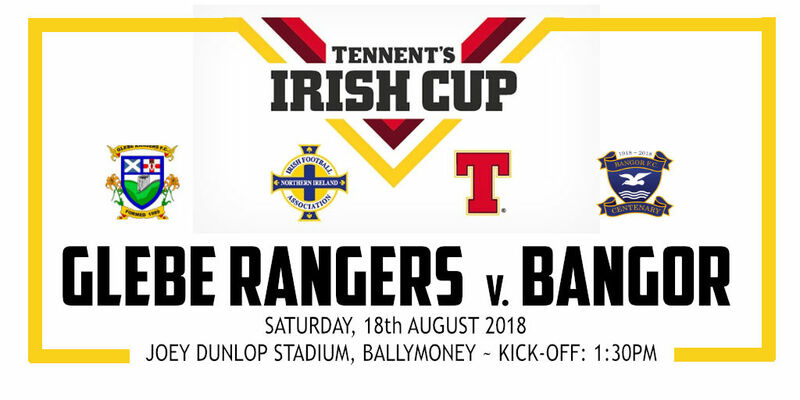 Bangor have been given an away tie against Glebe Rangers in tonight's draw for the Tennent's Irish Cup first round. The match, which is a repeat of last season's first round tie is scheduled to take place on Saturday, 18th August 2018. Bangor played out an encouraging 1-1 draw with Dollingstown in this afternoon's friendly at Clandeboye Park. Both sides had to battle against the elements as the weather conditions made life difficult for the players. Adam Calvert volleyed in a Ben Arthurs cross to put the Seasiders ahead in the 80th minute, but the Dollybirds hit back on 87' when a low shot evaded Darren Gibbons dive and crept inside the far post. Ben Arthurs and Jack Mallin have today signed for Bangor. Ben, a striker, spent two years with Ards before moving to H&W Welders in January where he scored in the George Wilson Cup Final for the victorious U-20 side. 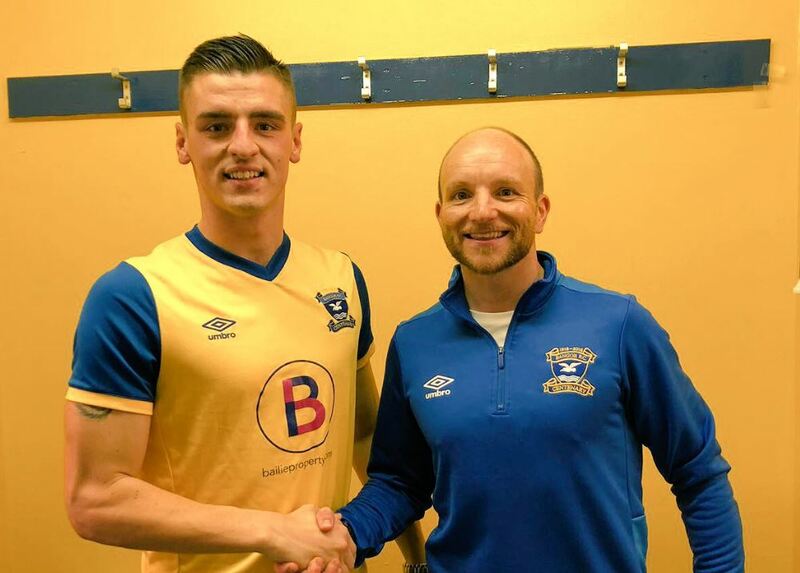 19 year-old Jack, who scored in the friendly against Carrick Rangers, joins his home town team after a spell with Cliftonville Olympic last season. 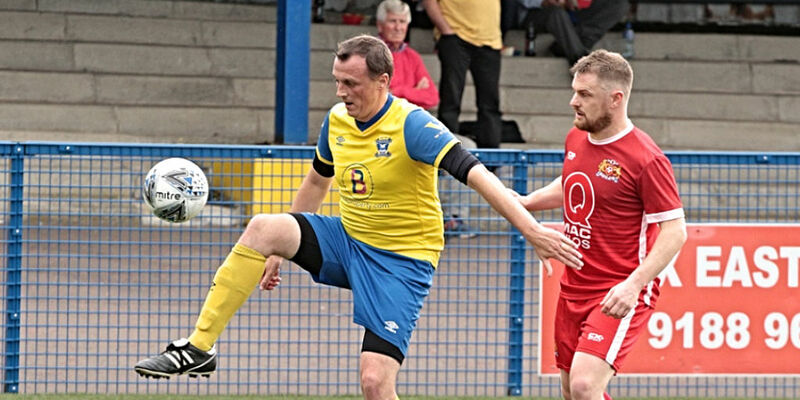 Bangor wore their new Centenary kit for the first time as they picked up their first win of pre-season over Niall Currie's Carrick Rangers in tonight's friendly at Clandeboye Park. New signing Thomas Wray headed in the opener for the Seasiders after 22 minutes in a keenly fought encounter. Jack Mallin slammed in a second from 12 yards out three minutes later. Captain Andy Long nodded in a third on 33 minutes after some great work from Ben Roy on the left. Both Darren Gibbons and Gareth Beattie denied Carrick their opener in what was a frantic series of last ditch tackles and goal line clearances just before half-time. Mark Cooling hit Bangor's fourth goal two minutes into the second half, before Carrick hit back with two quick Surgeoner goals on 50' and 55'. 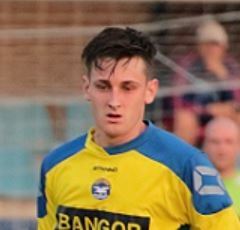 The match ended with injury concerns for one of the Carrick player and Bangor's Jordan Lucas. We were saddened to learn of the passing of Karen Edgar, mother Bangor defender Michael yesterday. Bangor Football Club extends their condolences and support to Michael and the family at this difficult time. A minute's silence was held before tonight's game as a mark of respect. We are pleased to announce that former Bangor defender Thomas Wray has returned to the club. The experienced defender was part of the Bangor squad that lifted the Intermediate Cup in 2014.Thomas rejoins the Seasiders from Championship side Dergview. 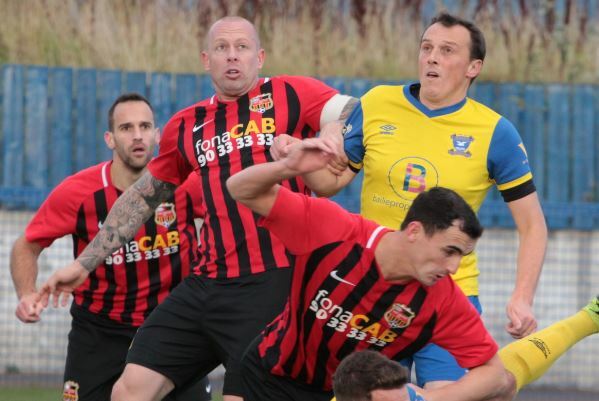 Neither side could find the net when Bangor and Ballyclare Comrades met in Tuesday night's pre-season friendly. On a night of few highlights, a breakaway chance from Ballyclare went narrowly wide of Darren Gibbons' right hand post, while a magnificent solo effort in the second half from Seasiders substitute Jack Mallon was pushed away by Comrades keeper Kyle Rowe. 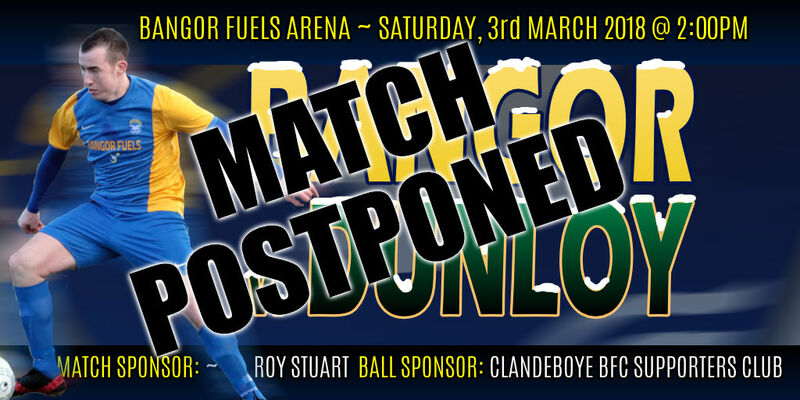 Thursday night's friendly against Ballywalter Rec has been cancelled. Bangor fell to a 3-0 defeat to full strength Linfield side in the sunshine at Clandeboye Park this afternoon. Jordan Stewart gave the Blues an 8th minute lead and dominated play for much of the first half. Bangor keeper Darren Gibbons pulled off two top class saves to restrict Linfield to a single goal at half time. Matthew Clarke's low strike deceived Gibbons to double Linfield's lead two minutes into the second half before an Adam Calvert own goal completed the scoring with seven minutes remaining. Bangor's best chance fell to Jordan Lucas who blasted his shot straight at Roy Carroll when clean through in the second half. Hugh Sinclair unveiled new signing Ally Ferguson earlier in the week. The 18 year old featured and scored in pre-season for the Seasiders last year and spent 2017/18 playing for Groomsport in the Northern Amateur Football League Division 1C. Welcome to the club Ally! 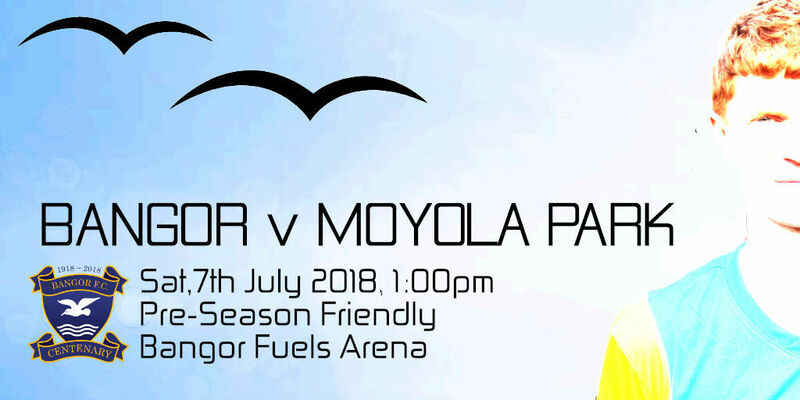 Bangor continued thair pre-season run of fixtures with a 2-1 home defeat to Moyola Park. 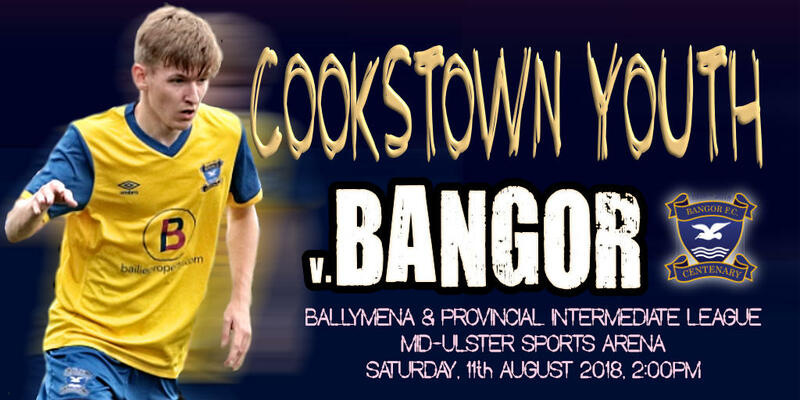 Mark Cooling gave Bangor a first half lead before Moyola Park hit back with two goals. Both sides missed a spot kick in the second half. Bangor kicked off their pre-season warm up this evening with a 4-1 defeat to Ards at the Bangor Fuels Arena. 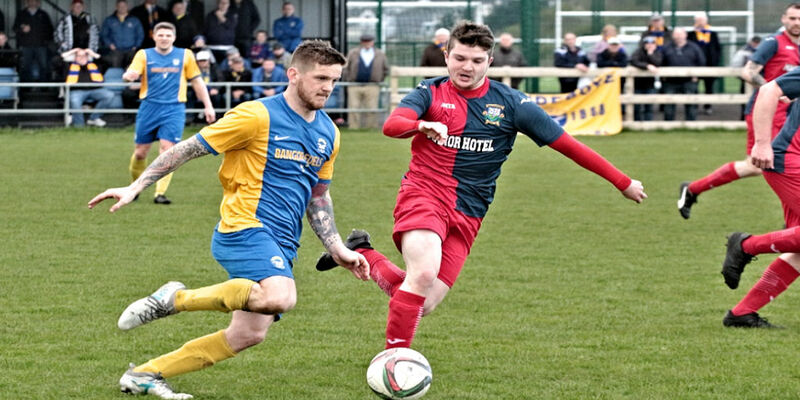 Ben Roy gave the Seasiders an early lead before Ards hit back with four second half goals from Jonny Frazer, Mark Kelly, Sean Noble and Marc McKenna. 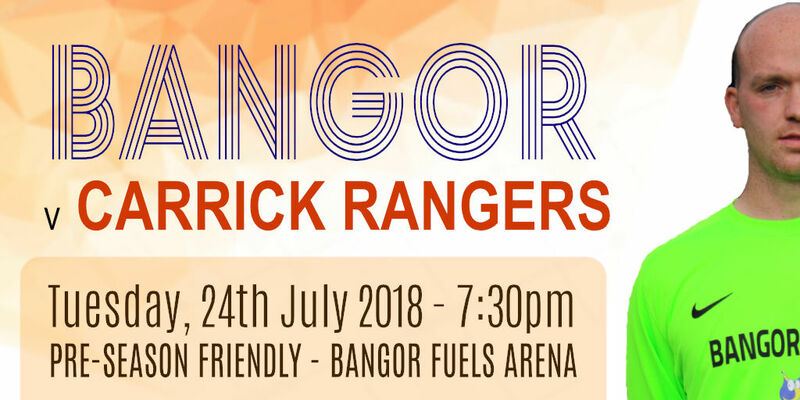 Bangor FC 2018/18 Season Tickets will be available to purchase on Thursday evening when the Seasiders take on Ards at the Bangor Fuels Arena. 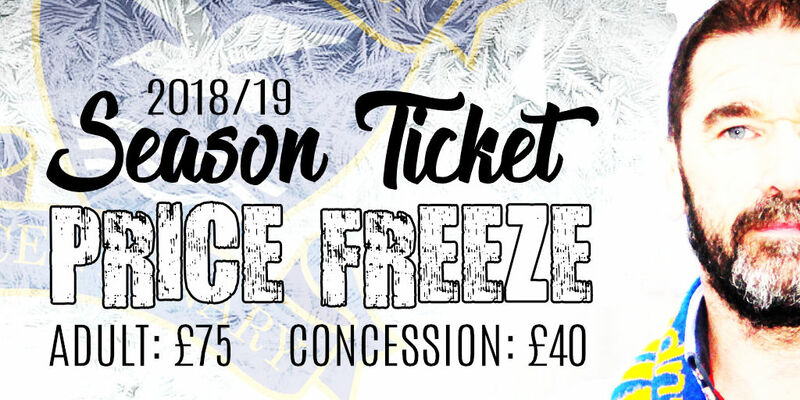 Season ticket prices will be the same as last year, having been frozen at £75 adult, £40 concession. Season tickets offer great value for money as they cover entry to 15 home league matches and all home ties in the 3 League Cup competitions. We are grateful once again to McKeown's Fish Monger & Poulterer of High Street for sponsoring our season tickets. 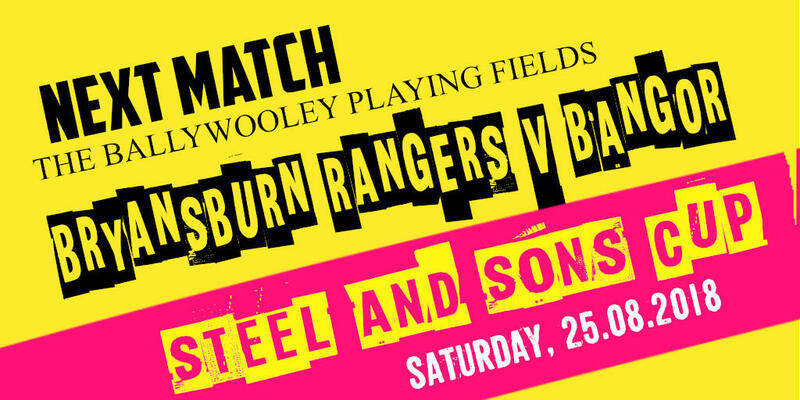 STEEL & SONS CUP DRAW: Bangor have been given a bye in the first round of the Steel & Sons Cup. 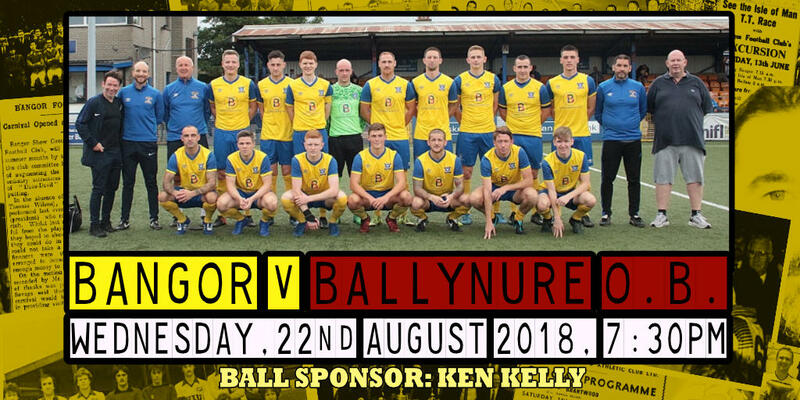 We will be making the short trip to Ballywooley to play Bryansburn Rangers on Saturday, 25th August. 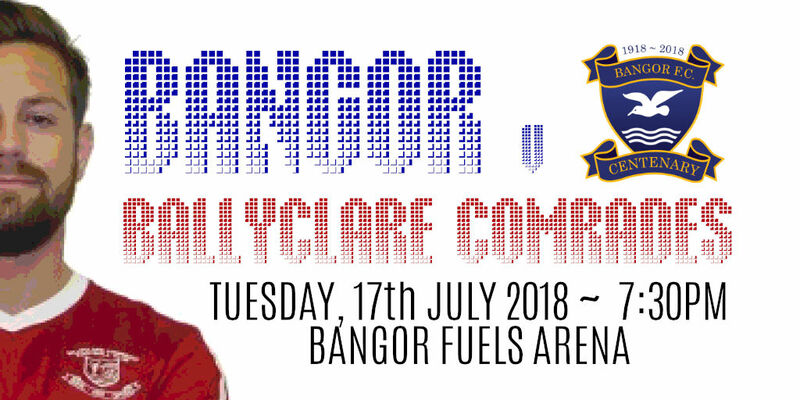 NEXT MATCH: Thu, 5th July, Bangor v. Ards, The Spectator and Chronicle Cup, Bangor Fuels Arena, 7:30pm. 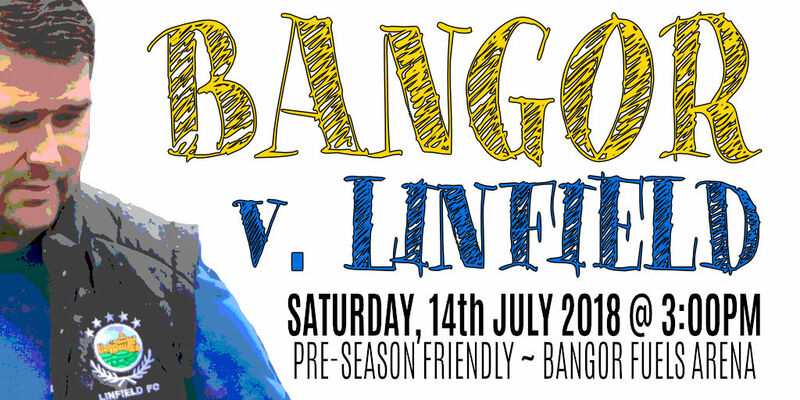 In a change to the pre-season fixture list, Bangor will play Linfield at the Bangor Fuels Arena on Saturday, 14th July, 3:00pm. The away fixture against Ballywalter Rec. has been moved to Thursday, 19th July, 7:00pm kick off. Bangor Football Club has taken control of pitch hire arrangements at Bangor Fuels Arena following the termination of its contract with Sportszone. This action was taken following Sportszone's failure to meet the terms of the contract and its refusal to make any payments to BFC in recent months. Proposals put forward by BFC to resolve this situation were rejected and so we were forced to act to protect our income stream. The board wrote to Sportszone in October 2017 identifying matters, including non-payment of sums due to the club, which in the board's opinion constituted breaches of the facilities management contract by Sportszone, giving rise to a right of termination of the contract by the club. Sportszone were afforded a 6 month period to remedy the matters identified to it by the board in accordance with the contract terms. The board pro-actively monitored the situation throughout the six month remediation period. In June 2018, the board resolved that Sportszone had failed to remedy the contract breaches identified to it in October 2017 and consequently proceeded with the termination of the contract on 14 June 2018. Since the current board gained control last year, we have sought to act in the best interests of BFC at every turn. The encouragement we have received from our supporters and the wider community continues to drive us forward. From Saturday 16th June 2018, all enquiries and bookings for the 3G pitch and facilities at Bangor Fuels Arena will be managed by Bangor Football Club. Any bookings made previously with the managerial company , Sportszone, will be honoured. Midfielders/Forwards: Mark Magennis, Jack Wasson, Ross Craig, Jordan Lucas, Ethan Boylan, Ben Roy, Sammy Devine, Gerard McMullan, Mark Cooling. 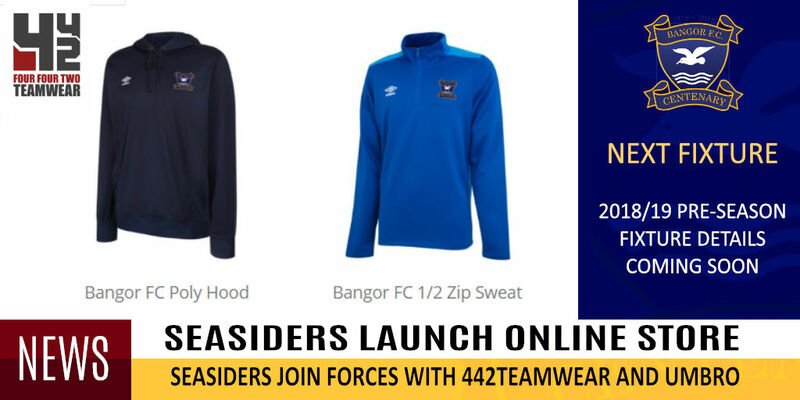 We are pleased to announce that Bangor Football Club have joined forces with 442Teamwear for our centenary season. A new range of Bangor FC Centenary merchandise including polo tops, jackets and training gear has been launched. These are all now available to order using the menu link above. 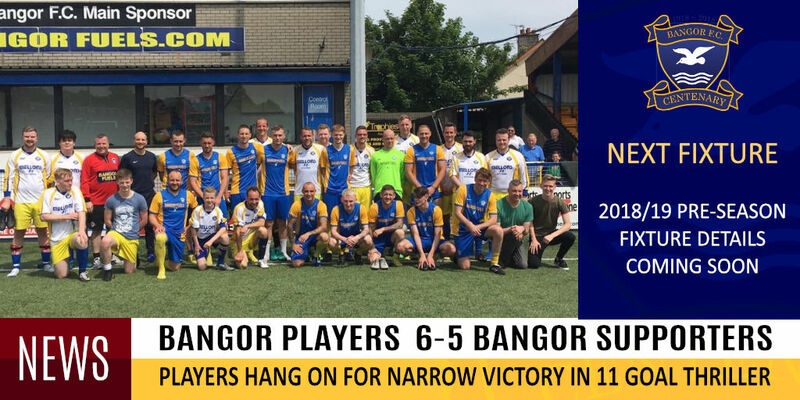 Bangor clinched a narrow 6-5 victory over the supporters team in an epic encounter at the Bangor Fuels Arena this afternoon. The Seasiders struggled to cope with the sheer physical presence of their opponents throughout and in the end had to dig deep to hang on in the closing stages of an 11 goal thriller. Thoughts now turn to tonight's Awards Dinner in the Bangor FC Social Club. Bangor Football Club are pleased to welcome Jeff Montgomery back to the club. 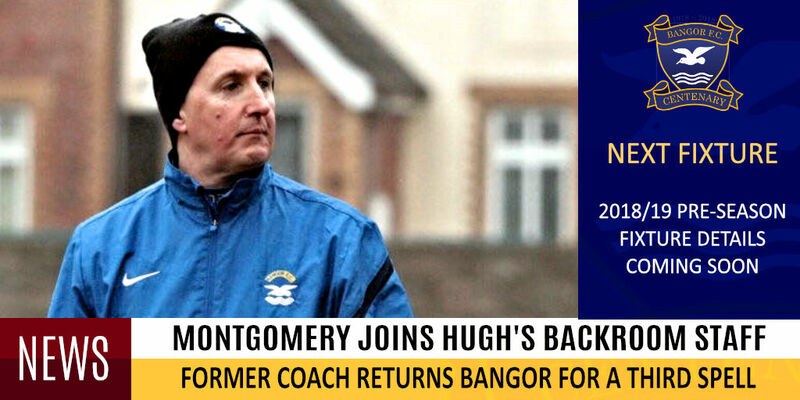 A highly qualified and experienced coach, Jeff returns to Bangor's backroom staff for a third spell, having previously worked alongside Garth Scates and Marty Quinn. 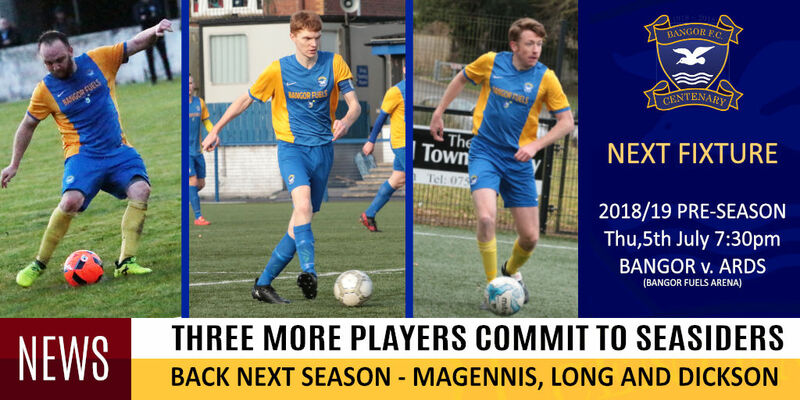 The club were pleased to reveal on social media yesterday that 13 of last season's squad will be turning out for the Seasiders again next season. Ethan Boylan, Chris Getty, Jack Wasson, Ross Craig, Jordan Lucas, Michael Edgar, Ben Roy, Sammy Devine, Darren Gibbons, Brett Widdowson, Gareth Beattie, Mark Cooling and Gerard McMullan. Voting is now open for the 2017/18 Bangor FC Goal of the Season. The Seasiders found the net 110 times this season and we have narrowed it down to 12 contenders. You can view the shortlist and place your vote >> HERE <<. Voting closed on Monday, 28th May. The winner will be announced on Saturday, 2nd June. 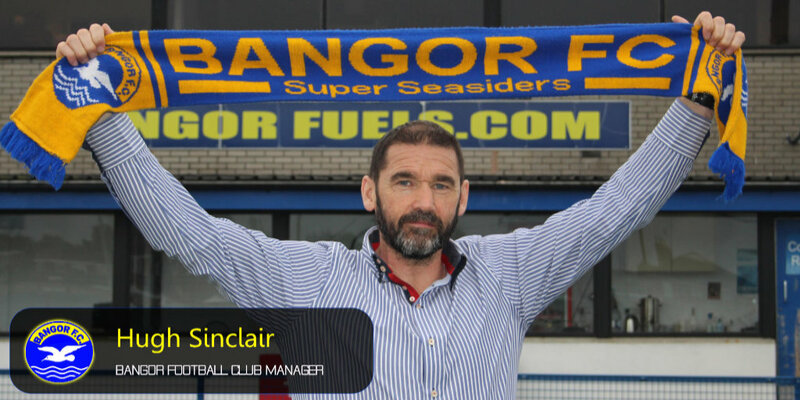 Bangor FC manager Hugh Sinclair and assistant Ross Williams will remain in charge of the Seasiders next season. 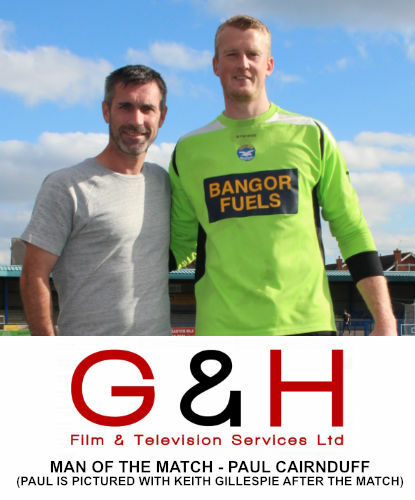 Bangor FC Chairman Nicky Davidson said: "I am pleased to announce that Hugh and Ross have agreed to remain at Bangor FC. 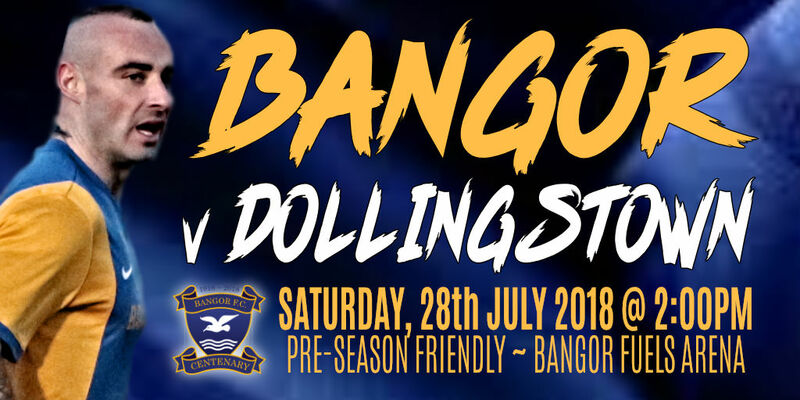 Hugh, Ross and their backroom staff have built something special on the pitch at Bangor and have helped pull everyone together in the new direction of the club. It is a great boost for the board, team and supporters that Hugh and his managerial team will remain in charge and all focus can again be targeted on winning the Ballymena and Provincial Intermediate League and gaining promotion." Hugh and Ross have already begun the process of speaking to the current playing squad in an effort to build their side for next season. Further details on this will be announced in the coming days. A BIG thank you to all the Friends of Bangor as well. Congratulations to Glebe Rangers who defeated St. James Swifts 1-0 at the Riada Stadium this evening to lift the Ballymena & Provincial Intermediate League title. A first half strike from Christie was enough to secure the victory for Glebe in a game where St James struck the woodwork on two occasions. Bangor finished the League season in second place on 58 points, just one point behind Glebe Rangers. Bangor returned to the top of the Ballymena and Provincial Intermediate League this afternoon with a 3-0 home victory over Dunloy. On target for the Seasiders were Captain Andy Long (58'), Jordan Lucas (60') and Ethan Boylan (pen)(92'). The focus now turns to the Riada Stadium on Monday evening where a victory for Glebe Rangers over third placed St. James Swifts will see the Ballymoney side lift the title ahead of the Seasiders. 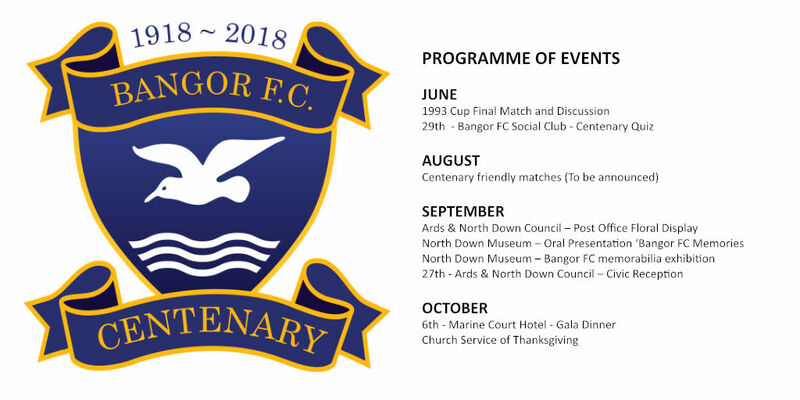 As part of the centenary memorabilia exhibition at the North Down museum, the football club is looking for fans to loan interesting artefacts for the retrospective in September and October 2018. These items could include old football kits, photographs and documents that reflect the rich history of the Club since its formation in 1918. If anyone would like to loan an item for the exhibition could they please email a description of the object before the end of May, with a note of its condition and/or any previous damage, as well as any related information about the history of the object or its significance. A photograph of the item would also help. 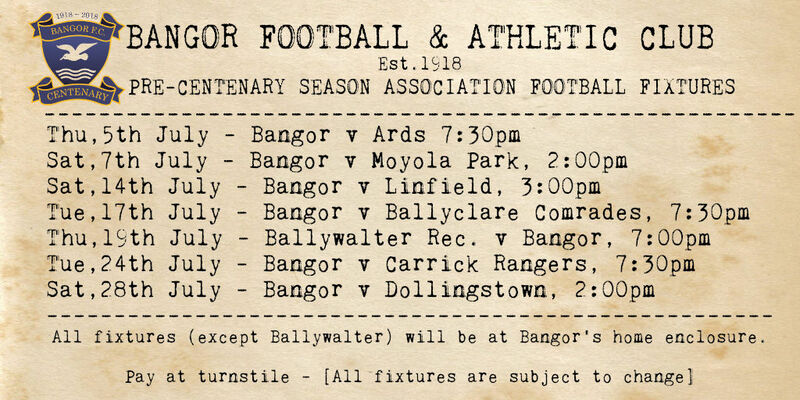 The email address is centenary@bangorfc.com, or contact any of the Directors. Gerard McMullan, Paul Dickson, Brett Widdowson, Keith Armstrong and Ross Craig. 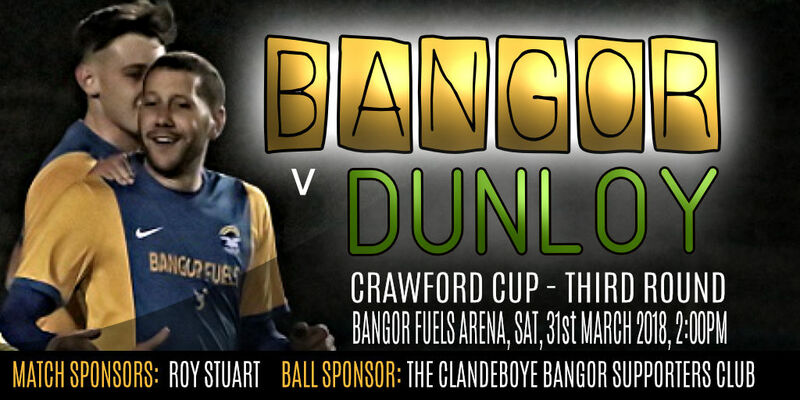 Bangor play their final League game of the season on Saturday (19th) when McReynolds Cup winners Dunloy visit to the Bangor Fuels Arena. Match kick off 2:00pm. With only a handful of games left, it remains very close at the top of the Ballymena and Provincial Intermediate League. Meanwhile, The McReynolds Cup Final between Dunloy and Coagh United takes place on Friday evening at Allen Park. Bangor captain Andy Long lifted the O’Gorman Cup for Bangor on Friday evening following a dramatic penalty shootout with Glebe Rangers at Allen Park. The match ended in a 2-2 draw, but Bangor romped home 3-0 winners in the penalty shootout. Neither side took control in a dour and scrappy first half, but Bangor took the lead when McMullan, the Glebe keeper fumbled the ball into the path of Ross Craig who fired into an unguarded net in the 43rd miinute. Following a spell of intense pressure, Glebel levelled matters in the 75th minute. Bangor were back in front one minute later when Gerard McMullan volleyed home a deft Ethan Boylan cross from 10 yard out. The Seasiders looked to be heading for a 2-1 victory, but a last gasp injury time goal from Glebe levelled it once again and sent the game into extra time. Glebe were reduced to 10 men late on, but the stalemate couldn’t be broken in extra time and the game was decided by a penalty shootout. Darren Gibbons was the hero of the shootout, saving the first two Glebe spot kicks while Mark Magennis and Ethan Boylan made no mistake with their efforts. When Glebe’s third penalty went wide of the upright, the decisive spot kick fell to captain Andy Long, who confidently drilled the ball past McMullan to the delight of the bumper Bangor travelling support. Congratulations to Mark Magennis who has picked up the Wolseys Player of the Month for March. During March, Mark featured in the home wins over Cookstown Youth (4-3), Chimney Corner(5-1) and Dunloy(3-0) and also in the away game to Sofia Farmer at Castledawson. His second goal against Cookstown Youth at the Bangor Fuels Arena will certainly be a contender for the goal of the season. Bangor came away from the Riada stadium with a vital 1-0 victory over title chasing Glebe Rangers this afternoon. On a tense afternoon, it was Jordan Lucas who grabbed the crucial goal after 14 minutes, latching on to a Mark Magennis through ball to fire low into the corner of the net. The Bangor defence stood firm throughout, with Brett Widdowson picking up the Man of the Match award. 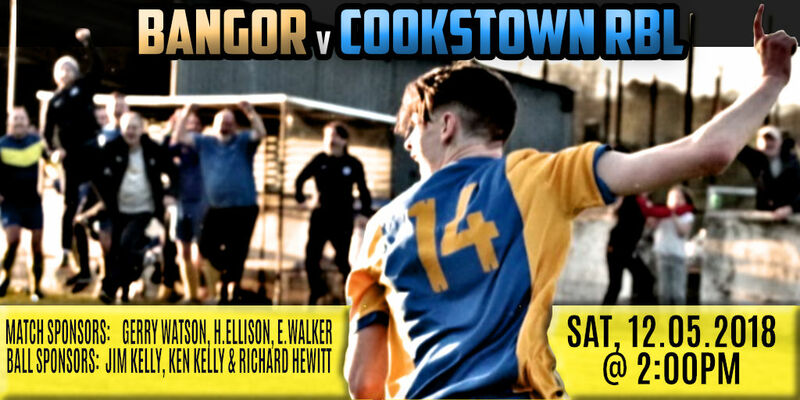 Bangor have 2 League games left(Cookstown RBL(H), Dunloy(H)) and have 52 points. Glebe Rangers have 44 points, but have five games remaining (Cookstown RBL(H), Dunloy (A), Brantwood(A), Coagh United(A), St James Swifts (H)). St James Swifts have 45 points and have three games remaining, including a final day showdown with Glebe Rangers. Bangor put on a fantastic team performance in front of a bumper crowd at Donegal Celtic Park this evening, running out 4-0 winners over a well-equipped St James Swifts side. 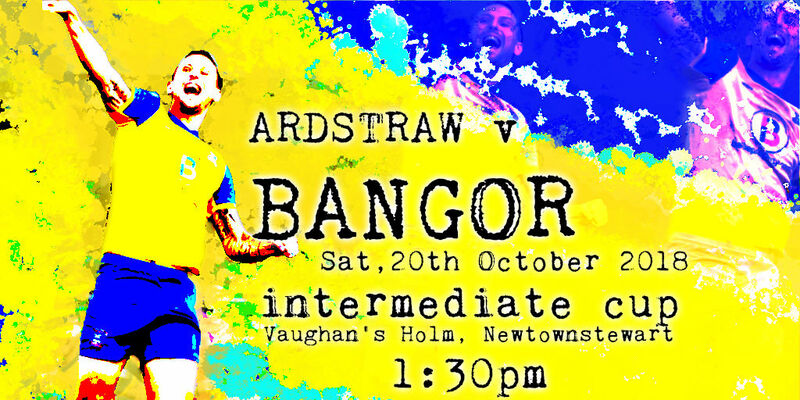 Captain Andy Long’s bullet header, which crashed in off the crossbar gave Bangor a deserved 20th minute lead. Mark Cooling doubled that lead from the penalty spot ten minutes later after Jordan Lucas was tripped inside the area. Mark Cooling grabbed his second of the game in the opening minute of the second half when Gerard McMullan slid the ball across the goalmouth for Cooling to slot home Bangor’s third. St. James were reduced to 10 men in the 53rd minute when midfielder Gary Dorrian slid in late on Gerard McMullan and received his second yellow of the match. Jordan Lucas completed the scoring by finishing off a neat move in the 72nd minute. 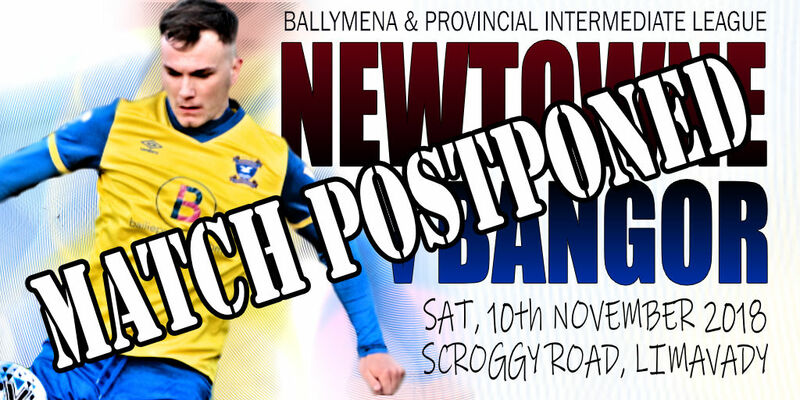 Our attentions now turn to the next match on Saturday when we travel to Ballymoney for a showdown with Glebe Rangers at the Joey Dunlop Centre. Second placed Glebe are hot on the heels of the Seasiders in the league table - they are 5 points behind with 3 games in hand. Bangor made it through to the final of the O'Gorman Cup this afternoon, winning 4-3 on penalty kicks after a 1-1 draw with St. James Swifts at Woodlands Playing Fields. Bangor will now face Glebe Rangers in the Cup Final which is due to be played at Allen Park, Antrim on Friday 4th May. A fairly uneventful first half burst into life in the 38th minute when Sammy Devine received his marching orders for a second yellow card offence. Four minutes later, the lively Ross Craig broke free on the left and produced a magnificent angled shot into the top corner of Maybin's net to give Bangor the lead. Darren Gibbons was rarely troubled in the second half, but some slack marking from a corner kick in the 82nd minute gifted Gary Dorrian with an easy headed goal from close range. Swifts defender Kyle Reid saw red late in the first period of extra time for a reckless challenge on Mark Cooling - Cooling clipped the crossbar with the resultant free-kick. On target for Bangor in the shootout were Andy Long, Brett Widdowson, Gareth Beattie and Michael Edgar - Mark Cooling and Michael McClean saw their efforts saved. The decisive kick fell to Maybin, the Swifts goalkeeper, who blasted his effort high and wide of the target. 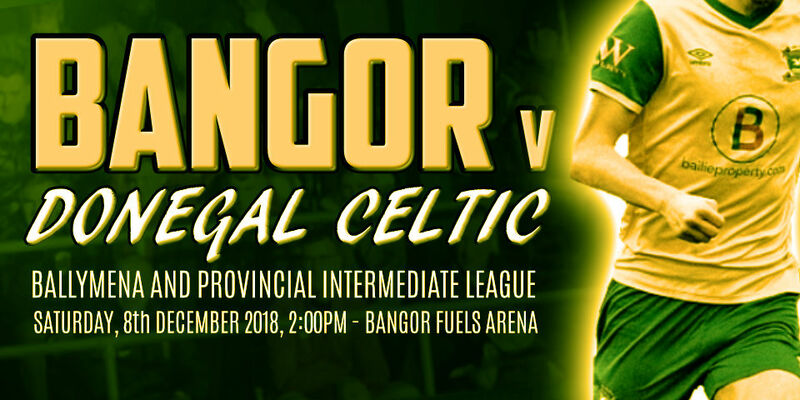 Bangor travel to Donegal Celtic Park, Belfast on Tuesday evening to face St. James Swifts once again, this time in a vital League fixture. Ballynure OB 2-0 Cookstown RBL, Desertmartin 2-3 Cookstown Youth, Coagh United 11(ELEVEN)-0 Sofia Farmer. 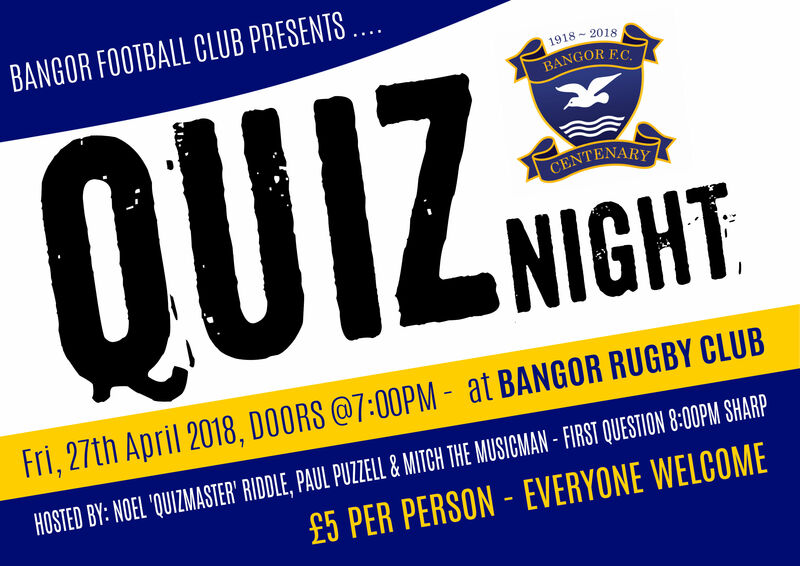 Bangor Football Club will be holding a Quiz Night in Bangor Rugby Club on the evening of Friday, 27th April. 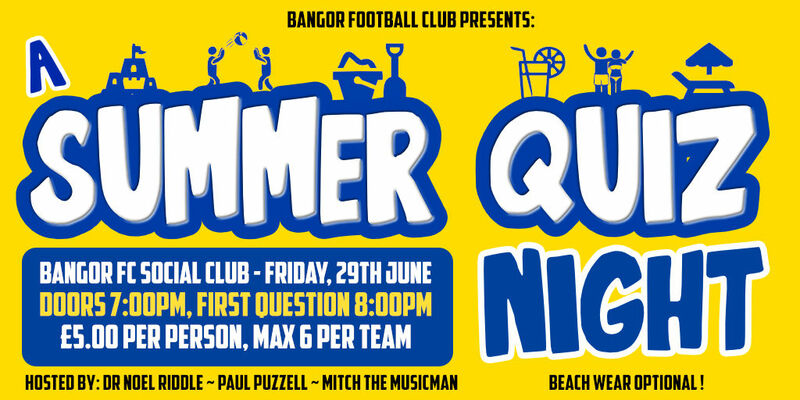 The hosts for the evening will be Noel 'Quizmaster' Riddle and his two glamorous assistants - Paul 'Puzzell' and Mitch the Musicman. Entry is £5 per person and questions start at 8:00pm sharp! 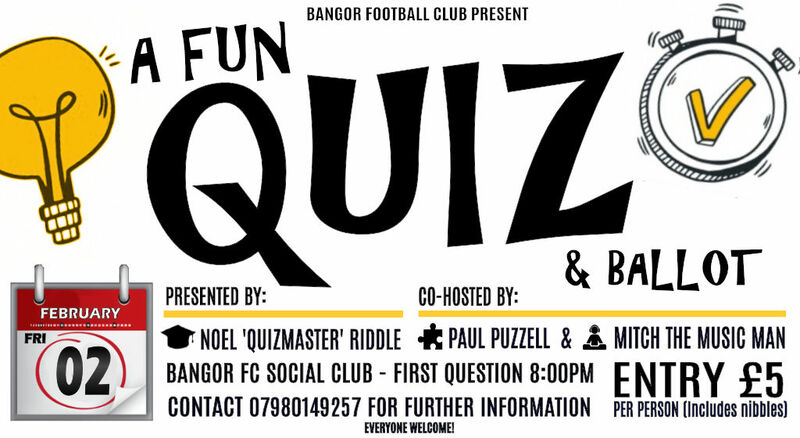 (Please note the venue is Bangor Rugby Club). Bangor lost out on a chance to reach the Crawford Cup Final this afternoon, losing to Glebe Rangers in a penalty shootout. Mark Cooling opened the scoring with a well struck 27th minute free-kick, but Dobbin levelled it for Glebe with nine minutes remaining in normal time. Substitute Jordan Lucas pounced on a Glebe defensive mistake four minutes into extra-time to give Bangor the lead, the game was tied five minutes from the end when Nichol rose highest to head home another equalizer. Michael Edgar and Mark Cooling were on target for the Seasiders in the shootout while Keith Armstrong blasted over and Sammy Devine saw his effort saved. 21.04.2018 - St. James Swifts v. Bangor, O'Gorman Cup Semi-Final, Woodlands,2:00PM. 24.04.2018 - St. James Swifts v. Bangor, BAPIL, Donegal Celtic Park, TBC. 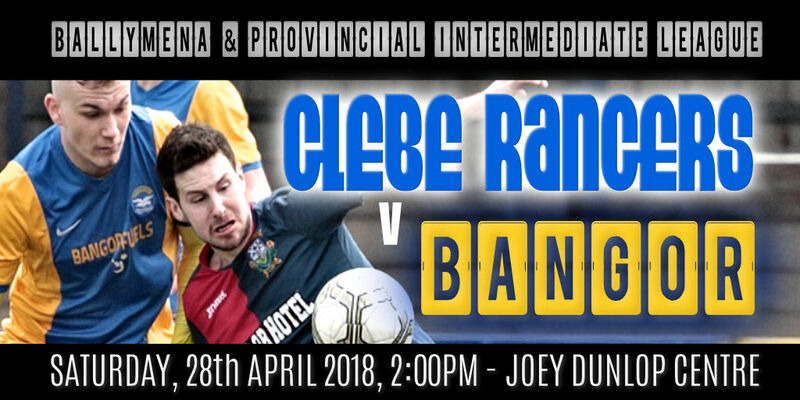 28.04.2018 - Glebe Rangers v. Bangor, BAPIL, Riada Stadium, 2:00PM. 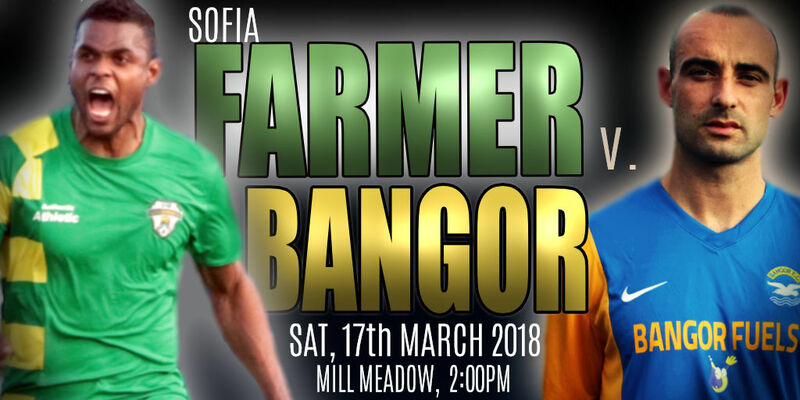 Following a successful protest, Bangor have tonight been awarded a 3-0 victory over Sofia Farmer who played an ineligible player in the league game at Mill Meadow on Saturday, 17th March 2018. 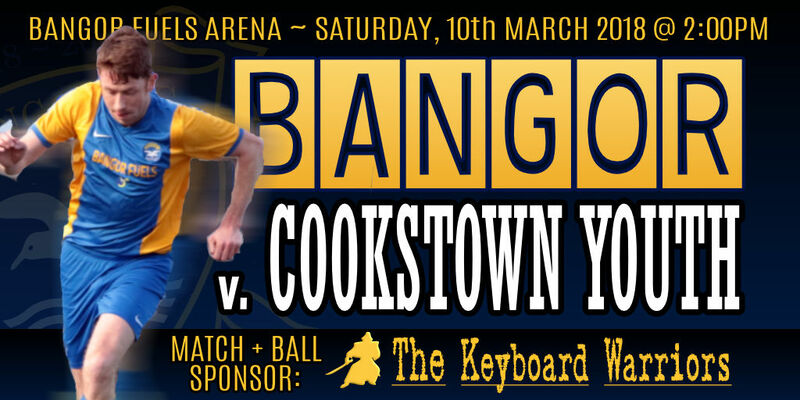 Bangor ran out 5-1 winners over Cookstown Youth at the Mid-Ulster Sports Arena this afternoon. On target for the Seasiders were Ben Roy, Mark Cooling, Ethan Boylan(2) and Gerard McMullan. Bangor started brightly and Ben Roy gave them the lead after 19 minutes. Ethan Boylan had rounded the keeper, but saw his finish come back off the upright. Andy Long picked up the rebound and crossed for Roy to smash home from close range. Once ahead, Bangor eased off and were punished on the half hour when a 20 yard strike arrowed into the corner of Darren Gibbons net. Bangor stepped up a gear in the second half and went in to a 2-1 lead on the hour when a looping Andy Long cross from the right saw several players clatter into the frame of the goal - the ball ended up in the back of the net via the upright and Ethan Boylan's back. Substitute Mark Cooling made it 3-1 two minutes later when he delivered a trademark 22 yard free-kick into the corner of the Cookstown net. Bangor were now in complete control and it was no surprise when Ethan Boylan blasted home a rebound from a Magennis cross on 74 minutes to make it 4-1. 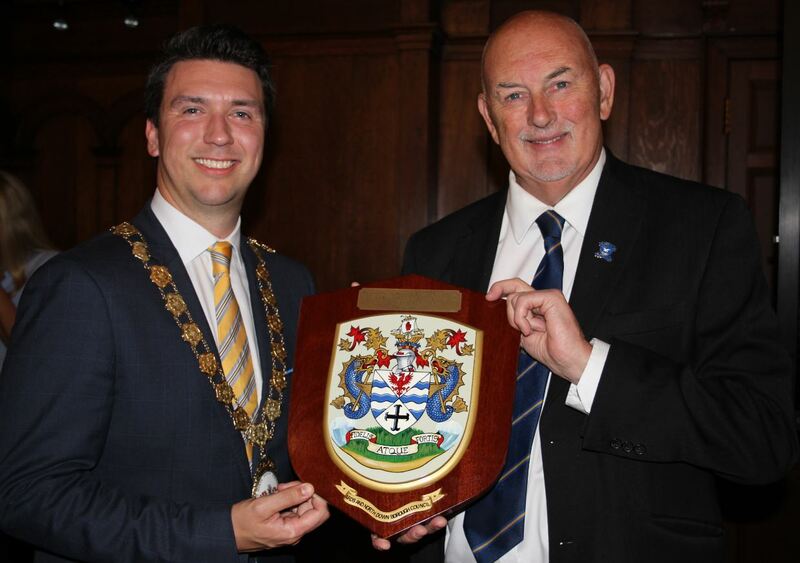 Bangor Football Club has unveiled a new club crest featuring a traditional seagull, sea and shield emblem with a sweeping centenary banner for this landmark occassion. 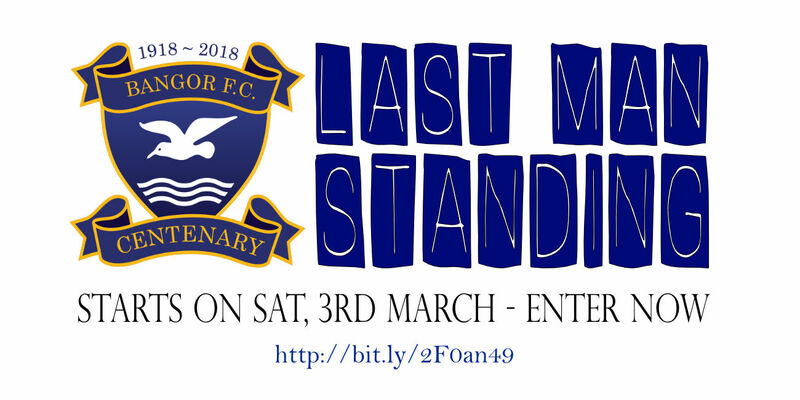 In April we will launch a Centenary Ballot and in May we will hold a special function where we will re-live the glory of the 1993 Irish Cup Final. Over the summer there will be an evening with some very special guests and also a special centenary football match. The floral display beside the main Post Office in Bangor will be dedicated to the Bangor FC Centenary in September. This month will also see the launch of a special Bangor Football Club exhibition at Bangor Museum. Another highlight of the year will be a special Gala Dinner which will be held in the Marine Court Hotel on Saturday, 6th October 2018. More information on each of these events and others will be published here in due course. 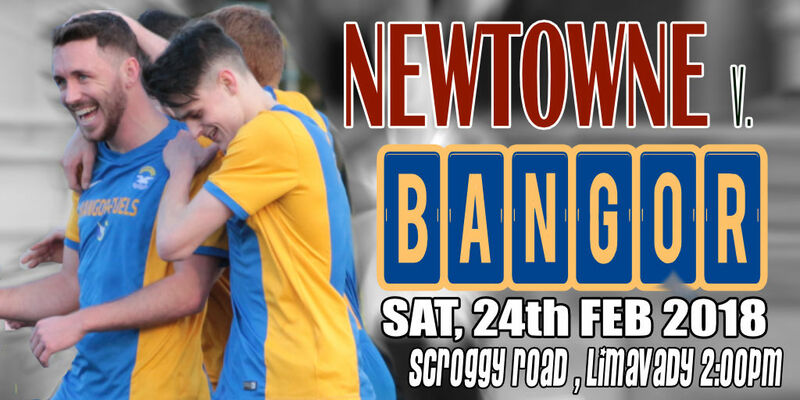 Bangor produced an epic finish to claim three valuable points at Scoggy Road this afternoon in an entertaining and feisty match against Newtowne. The Seasiders got off to a slow start, but managed to take the lead in the 33rd minute when Ben Roy headed in a rebound off the Newtowne keeper after good work from Gerard McMullan. Bangor's lead was short lived and Newtowne levelled matters soon after from the penalty spot. The game burst into life in the second half when Ethan Boylan slid into a tackle and a melee ensued. The referee stopped the game for several minutes and a player from each side was dismissed - Ethan Boylan was given a straight red. 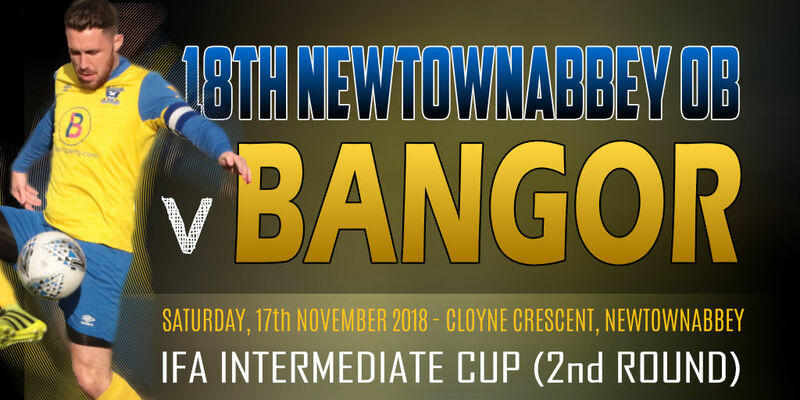 Newtowne, who had played some tidy football throughout, put together a great passing move a carve open the Bangor defence in the 85th minute and take the lead. Bangor pressed for an equaliser, but saw several chances go begging. As the clock ran down in injury time, the ball was cleared out to defender Paul Dickson standing 35 yards from goal. He dispatched a speculative lob towards goal that evaded everyone and bounced inside the six yard box and rose up into the back of the net beyond the static Newtowne keeper. Bangor continued to push for a winner in the dying seconds and a perfectly delivered inswinging corner from Mark Cooling on the right saw Chris Getty (wearing the captain's armband) rise up and power home the winner from close range. The scenes were rapturous. Bangor ran out comfortable 4-0 winners over Chimney Corner at the Bangor Fuels Arena in a second round O'Gorman Cup tie this evening. Ethan Boylan got Bangor off to a great start when he smashed home a deep cross from Mark Magennis on the right after just 4 minutes. The Seasiders had a setback after 8 minutes when an injured Gareth Beattie had to be carried off the pitch. Boylan grabbed his second of the game from the penalty spot after 33 minutes after he had been brought down in the area by the Corner 'keeper Wilkinson. The Seasiders remained on top for much of the second half, but had to wait until the 80th minute to get their third goal - Dale Patton rose highest to head home a Mark Cooling corner-kick from the right. The lively Ross Craig completed the scoring in the 89th minute when his 25 yard strike found the net off the underside of the crossbar. 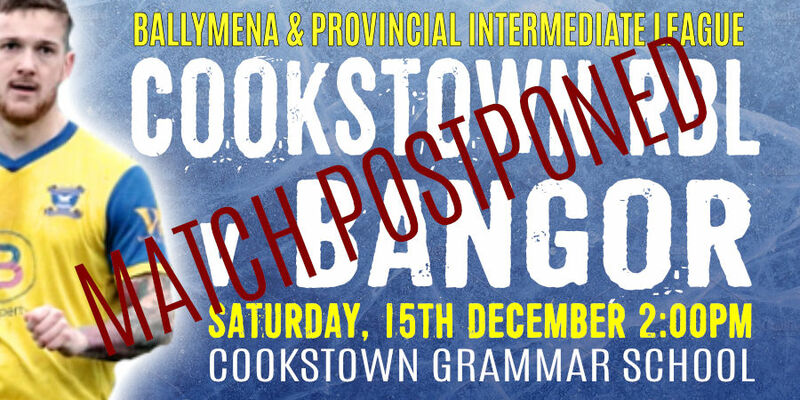 Bangor will now have an away fixture in the semi-final of the O'Gorman Cup and will play the winner of the St James Swifts v. Sofia Farmer tie. Date to be confirmed. MAN OF THE MATCH: Ross Craig. Bangor ran out comfortable 8-0 winners over Desertmartin at the Bangor Fuels Arena this afternoon. 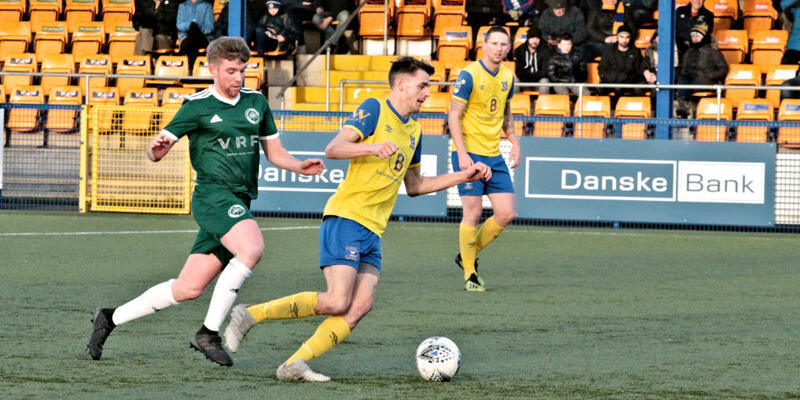 The Seasiders were frustrated in the opening quarter, but the floodgates opened after Sammy Devine headed home a Mark Cooling corner in the 27th minute. A delightful chip from Gerard McMullan in the 37th minute made it 2-0 and Ethan Boylan made it 3-0 four minutes later when he headed in Mark Cooling's corner kick from the right. A trademark 30 yard strike from Mark Cooling made it 4-0 before Ben Roy scored his first goal for Bangor on the stroke of half-time following some great work from McMullan on the right. 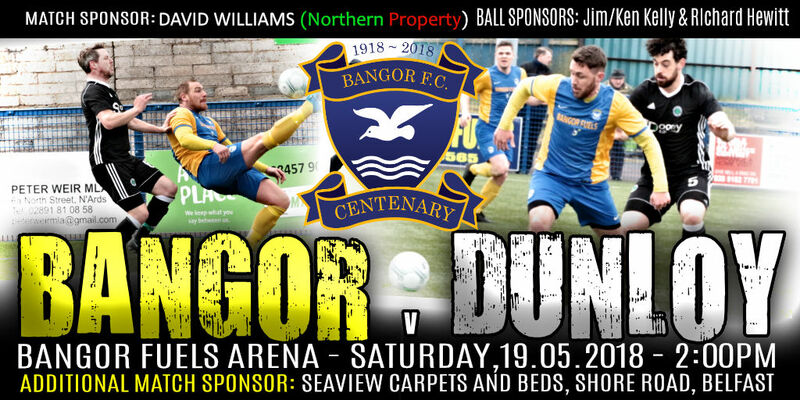 Bangor continued their dominance in the second half and it wasn't long before Ben Roy smashed home a rebound off the keeper for Bangor's sixth in the 55th minute after good work from Mark Magennis. Substitute Ross Craig robbed the Desertmartin 'keeper of the ball and set up fellow sub Keith Armstrong for a simple tap in for Bangor's seventh, before Gareth Beattie broke free on the right in the 78th minute to fire home and complete the rout. 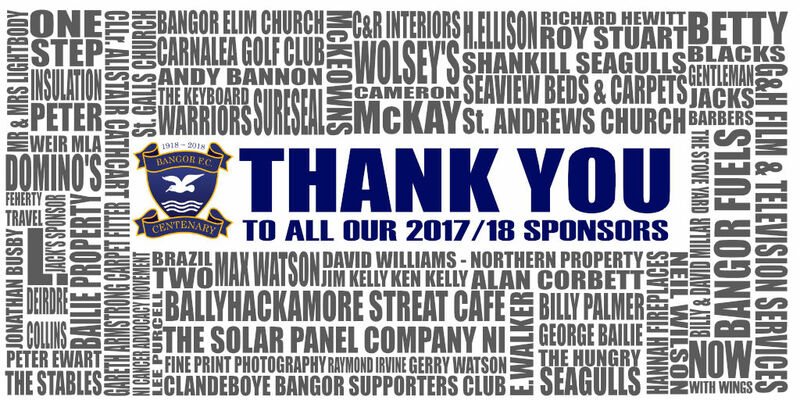 A big thank you to our match and ball sponsors for Saturday's game: The Hungry Seagulls and Bangor Elim Church. Our sponsors are pictured below with Man of the Match Ben Roy. 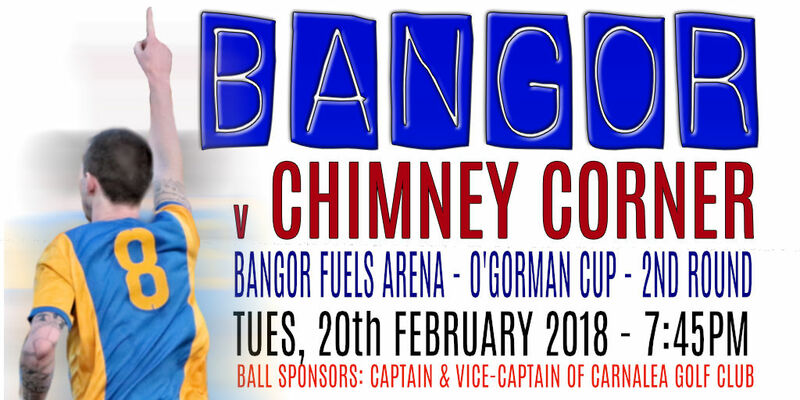 NEXT FIXTURE TUESDAY NIGHT - Bangor play a second round tie against Chimney Corner on Tuesday evening. OTHER SCORES: St. James Swifts 2-0 Brantwood, Sofia Farmer 1-1 Cookstown RBL, Dunloy 0-1 Ballynure OB, Chimney Corner 0-9 Newtowne. Bangor had to settle for a point in their league match against Brantwood at Skegoneill this afternoon. Despite having the lion's share of possession throughout, Bangor struggled to find a way through a resolute Brantwood defence. Mark Cooling came closest for the Seasiders in the first half when his 20 yard strike was parried round the post by the Brantwood 'keeper. The best chance of the game came in the second half when Ethan Boylan's driven shot from the edge of the penalty was also pushed round the post. A new look Bangor defence of Getty, Dickson and Edgar were comfortable throughout despite the muddy conditions. We were delighted to welcome former player Reggie Dornan to the Bangor Fuels Arena as a special guest on Saturday afternoon. Reggie, who is the Newcastle United Foundation Disability Football Development Officer was a first team regular for the Seasiders between 1981 and 1999. A talented defender, he picked up a County Antrim Shield medal in 1989 and was part of the 1993 Irish Cup winning squad. Reggie hung up his boots at the age of 40, and after a spell at Dundela, he moved to England to take up his current position at Newcastle United in 2011. 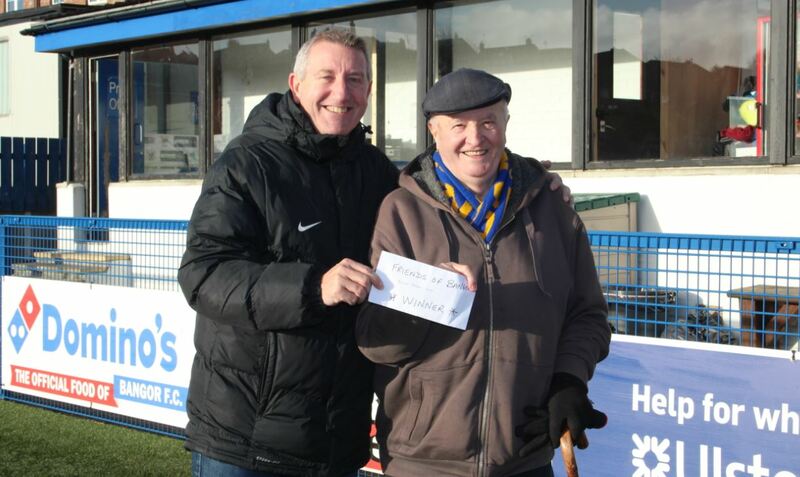 Reggie made the Friends of Bangor draw on Saturday afternoon, and was pictured handing over the prize to the winner Ernie Beattie. Congratulations Ernie! Great to see you back Reggie! 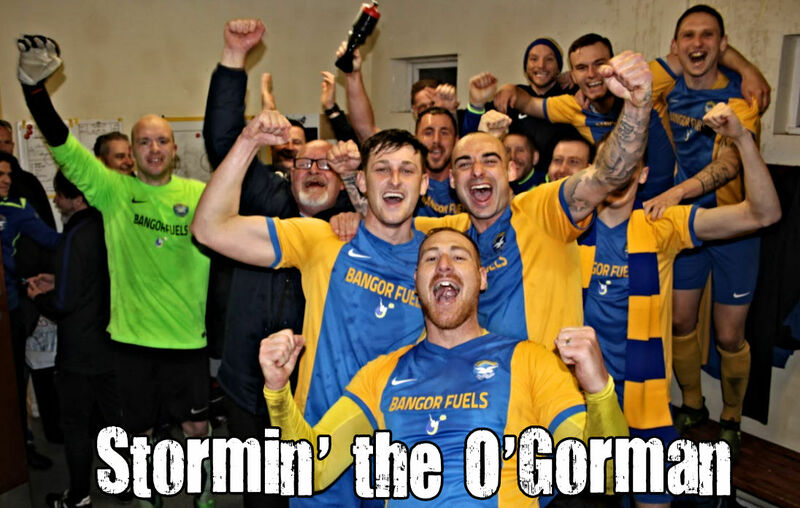 Bangor made it through to the quarter final stage of the O'Gorman Cup with a nervy 3-2 win over Ballynure Old Boys at the Bangor Fuels Arena on Saturday afternoon. An unmarked Keith Armstrong had the simple task of heading Bangor into an 11th minute lead after Ben Roy's lofted ball from the right had glanced off the crossbar. Some nifty footwork from Ross Craig on the edge of the Ballynure penalty area made enough space for him to shoot the Seasiders into a two goal lead after 18 minutes. Bangor looked to be in control of the game, but a miscued defensive clearance at the back post gifted Robert Watson with an easy chance for Ballynure to pull one back in first half injury time. Bangor 'keeper Darrren Gibbons was forced into making a string of excellent second half saves as Ballynure went in search of an equalizer. 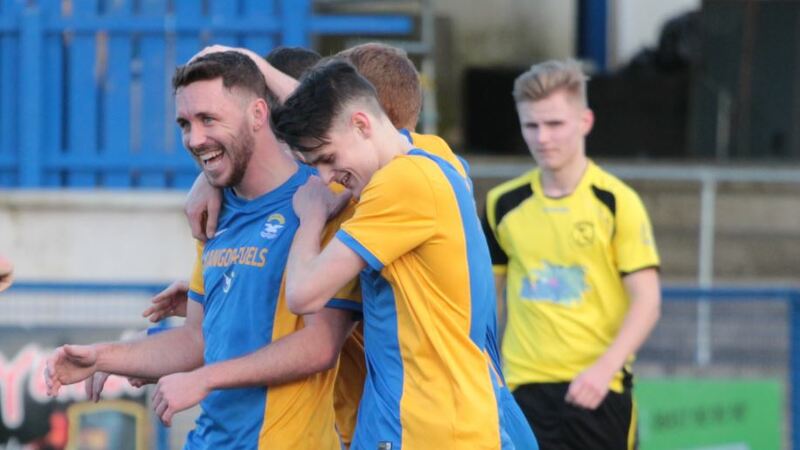 However it was the Seasiders who finally found the net in the 86th minute when a defensive mix up gave substitute Gerard McMullan a chance to drill the ball past Adams to give Bangor a 3-1 lead. 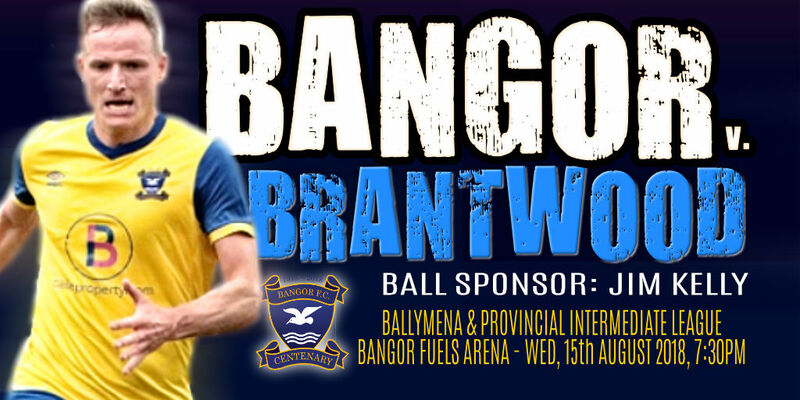 The game looked to be over, but a 90th minute mis-hit own goal from Gareth Beattie gave Bangor a nervous couple of minutes as Ballynure threw everyone forward in injury time. 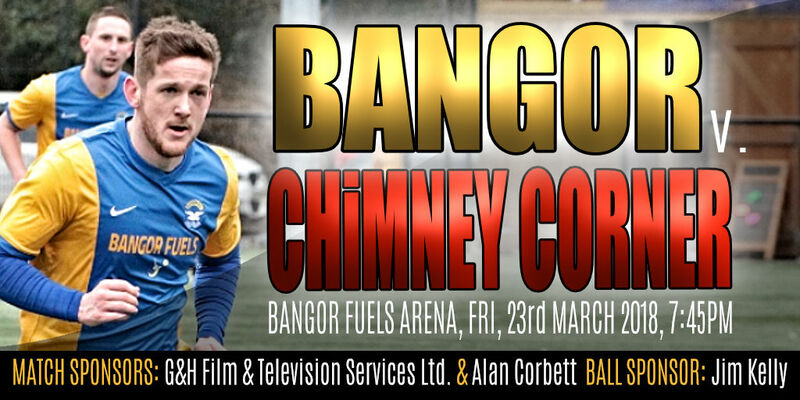 Bangor will play Chimney Corner the Bangor Fuels Arena in the quarter-final stage of the O'Gorman Cup. 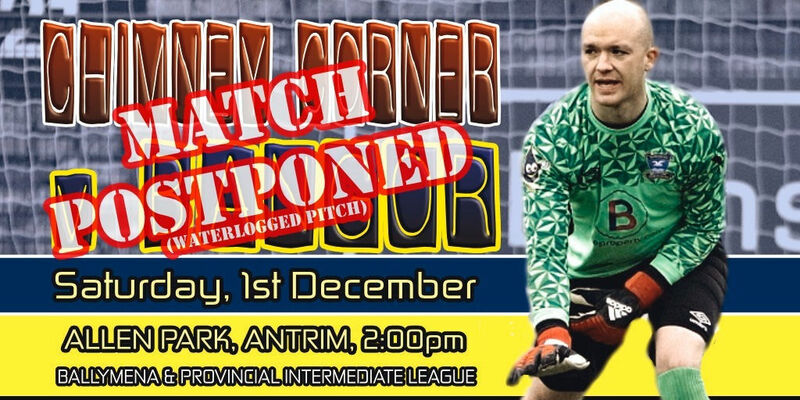 A date for this fixture has yet to be confirmed. 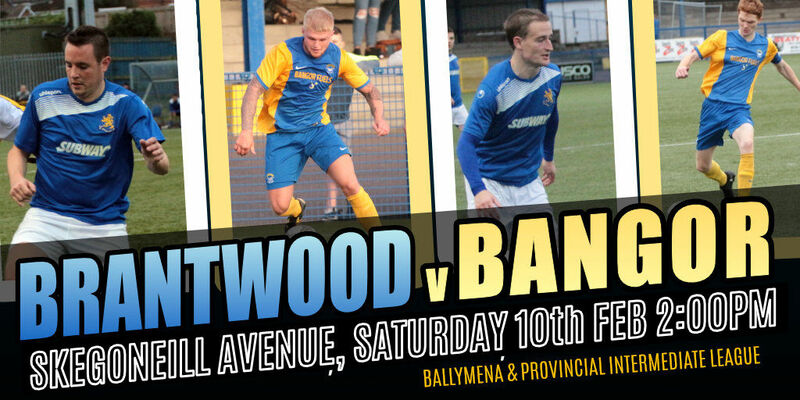 Bangor are back in action next Saturday when we travel to Skegoneill Avenue to face Brantwood in a league match. Match kick-off 2:00pm. 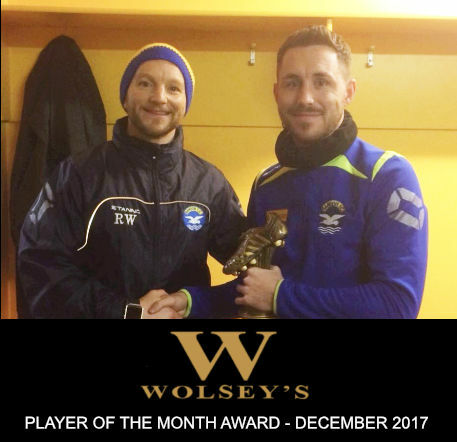 Congratulations to striker Ethan Boylan who picked up the Wolsey's Player of the Month Award for December. Ethan bagged three crucial goals in our games against Glebe Rangers and Coagh United back in December. 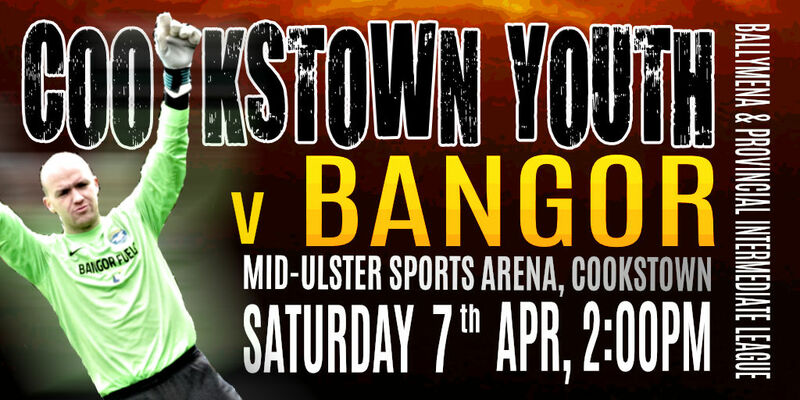 Bangor will play Ballynure O.B. 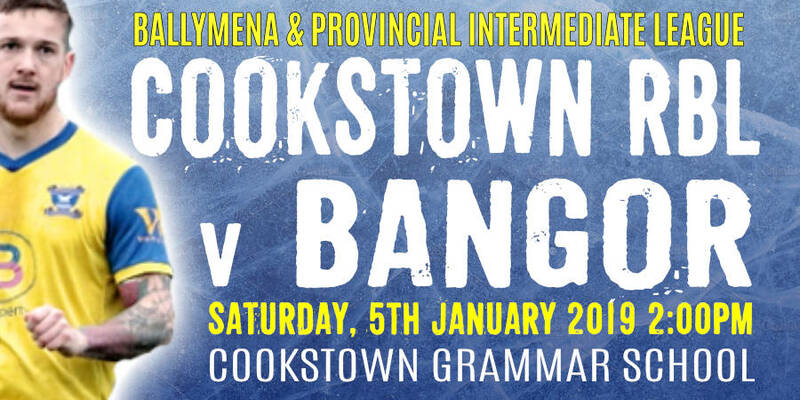 at the Bangor Fuels Arena next Saturday (3rd February) in the O'Gorman Cup. Match Kick-off 1:30pm. We are pleased to announce the addition of two new faces to the Bangor squad. 28 year old striker Ben Roy joins the Seasiders from Carrick Rangers. Ben was part of the Carrick Rangers Championship One winning side and also finished as the league's top scorer in the 2013/14 season while playing for Dundela. Also joining the Seasiders is the experienced Paul Dickson. Paul has been a first team regular at H & W Welders for many years and has over 200 appearances under his belt for the east Belfast side. 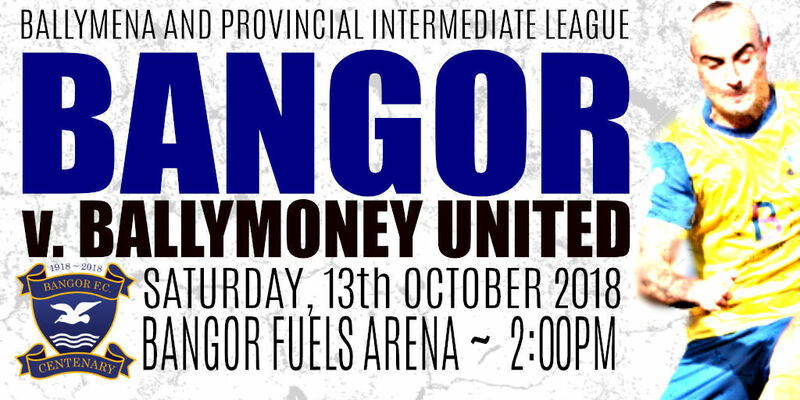 We welcome both players to the Bangor Fuels Arena. Today we say farewell to midfielder Karl Rossborough who has opted to re-join his former club Donegal Celtic in the Bluefin Premier Intermediate League. Karl joined the Seasiders back in August and quickly become a popular first team regular. Karl didn't manage to find the net during his time at Bangor, but came close at Dunloy and Desertmartin We wish him well for the future and thank him for his efforts this season. Messi is a parrot who recently escaped from his owner's home in Newtownabbey. He had been spotted in the Merville/Shore Road area of Belfast before heading out across Belfast Lough towards the bright lights of Bangor. Messi was reportedly sighted in the Bangor area earlier today and his owner Mr McHugh has asked us to spread the word about his missing parrot. We are only too glad to help. 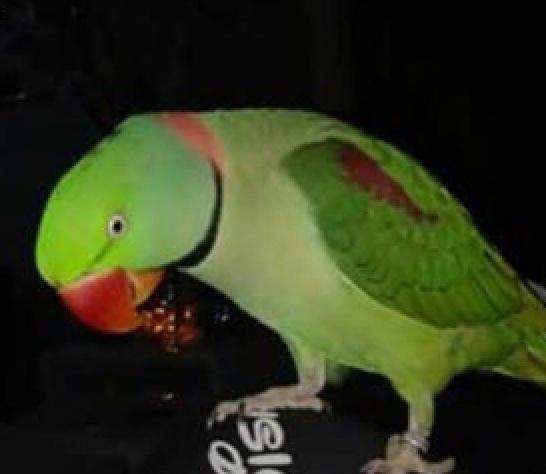 Please get in touch with us HERE if you have seen the missing parrot. Bangor progressed into the next round of the Crawford Cup with narrow 1-0 win over FC Whiteabbey at the Bangor Fuels Arena this afternoon. Hugh Sinclair made a number of changes to his starting line-up, with Craig, Patton, Cooling and Armstrong all featuring. Ross Craig produced the decisive strike in the 33rd minute after being set up by Andy Long. We are delighted to announce that defender Brett Widdowson has returned to the club. Brett progressed through the Bangor ranks and made his first team debut in the 2015/16 season before departing last summer. Welcome back Brett! St. James Swifts 1-2 Glebe Rangers, Desertmartin 2-2 Coagh United, Sofia Farmer 4-3 Cookstown Youth, Chimney Corner 0-8 Dunloy. 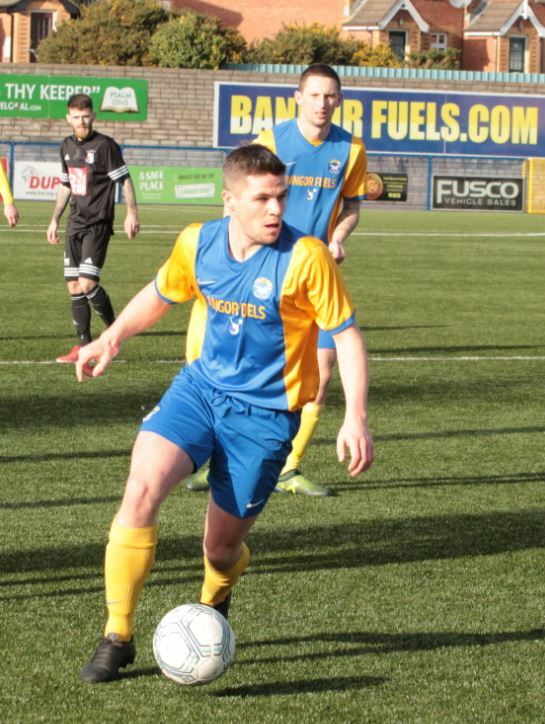 We are delighted to confirm that midfielder Mark Cooling has re-joined Bangor. Mark returns to the Seasiders for a second spell after first joining in January 2013 when he scored 39 goals in three and a half seasons. Mark scored the first ever competitive goal on an artificial surface at Clandeboye Park and was part of the Bangor team that lifted the Intermediate Cup in 2014. Welcome back to Bangor Mark! With the January transfer window now open, we say farewell to both Niall Atkinson and Neil Graham. 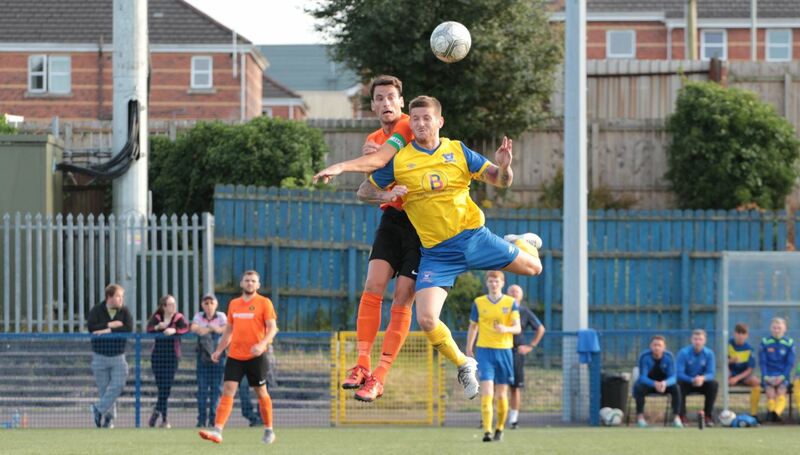 Both players joined the Seasiders last summer but have had limited game time in recent weeks. Niall found the net once this season, scoring Bangor's third goal with a delightful lob in a 3-0 victory over Cookstown RBL at Beechway. He re-joins his former club Knockbreda. Neil was also on target once, coming off the bench to score Bangor's seventh in a victory over Chimney Corner at Allen Park in October. Neil will be joining Albert Foundry. We would like to express our thanks to both players and we wish them every success at their new clubs.